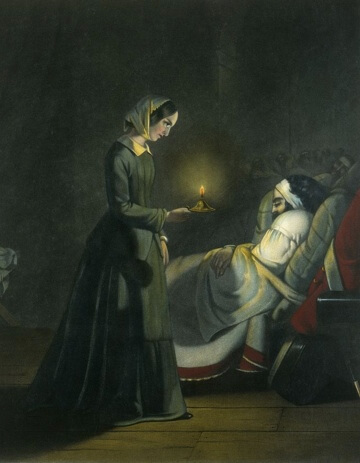 Florence Nightingale, The Angel of the Crimea: A Story for Young People was published by Laura E. Richards in 1911. The chapter book is featured in our collection, Books for Young Readers. You might also enjoy reading Nightingale's book, Cooking by Troops for Camp and Hospital, commissioned by the Army of Virginia during the American Civil War. "To the Sister Eleanor of the Sisterhood of Saint Mary, worker for the poor, sick, and the sorrowful, this brief record of an heroic life is affectionately dedicated." Chapter I - How Florence Got Her Name - Her Three Homes. Chapter II - Little Florence. Chapter III - The Squire's Daughter. Chapter IV - Looking Out. Chapter V - Waiting for the Call. Chapter VI - The Trumpet Call. Chapter VII - The Response. Chapter IX - The Barrack Hospital. Chapter X - The Lady-in-Chief. Chapter XI - The Lady with the Lamp. Chapter XIII - Miss Nightingale Under Fire. Chapter XIV - The Close of the War. Chapter XV - The Tasks of Peace. Return to the Laura E. Richards library.